AVAILABLE TILL THE END OF MAY AND EXCLUSIVE TO IRVINGS BUTCHERS – Herdwick Lamb from Chris Turner at Ulpha. 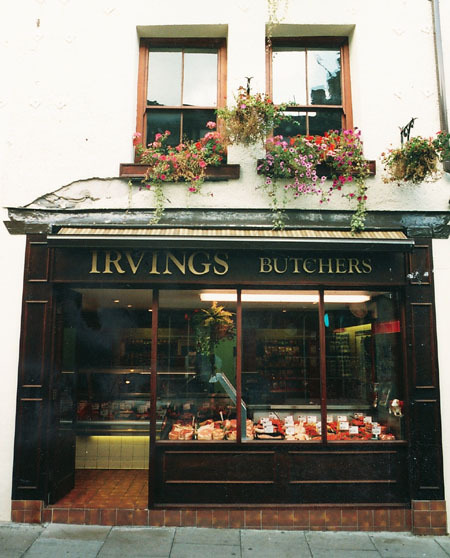 Established in Ulverston in the early 1800’s, John Turner became the proprietor of Irvings Butchers in 1977. Irving’s butchers have built their quality reputation by sourcing beef and rare breed pork from local farmers. The lamb is sourced from local farmers and Ulverston auction mart, and all chicken is purchased within Cumbria. Irving’s award winning Cumberland Sausage and Dry Cured Bacon are famous both locally and nationally, and are a must purchase whilst shopping in the historic market town of Ulverston. Irving’s is also a stockist of Waberthwaite Cumberland Sausage and Cartmel Sticky toffee pudding. The excellent staff and one to one customer service at Irvings Butchers means I can ask specific questions about my meat and poultry and know a knowledgable answer will be forthcoming. 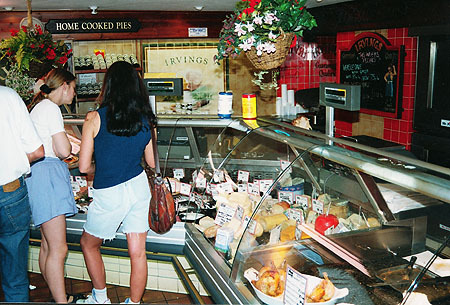 As well as the famous butchers, Irving’s has a well established Delicatessen, where customers can buy ready meals, cooked meats, and pies of choice. For those who require a quick lunch, Irving’s offers Dinner Time Specials, from Hotpot to Chicken curry and various Pasta dishes. Refreshments such as Coffee and hot Chocolate are also available. If you are catering at home for a party or social event, Irving’s is well worth a visit.. You can purchase anything for your event from a leg of lamb or T bone steak to traditional barbeque food, pie and peas, a selection of cold meats, plus food for the buffet. John, Keith, Ian and Darren form the team of butchers at Irving’s.. Between them they have over 100 years experience in the trade, and along with the dedicated and friendly staff, make Irving’s Butchers a priority visit whilst out and about shopping in Ulverston.. The quality and totally unique flavour of Gloucester Old Spot Pig. Join the throngs of people who are purchacing the Cured Bacon,Gammon and Sausage that has been prepared exclusiveley for Irvings Butchers. A MUST PURCHACE WHILST SHOPPING IN THE HISTORIC MARKET TOWN OF ULVERSTON. ALL MEAT IS LOCALLY SOURCED – For your new years day dinner, try our locally sourced Saltmarsh Lamb. Irvings Butchers- Make your Christmas extra special! Orders are now being taken for Locally Reared White and Bronze Turkeys, Free range Geese and Chickens, as well as fresh duckling and rib on the bone. We also offer a wide range of non traditional Christmas meat to suit your own palate. Call in to discuss your Christmas order! Wonderful selection of meat in Irvings, with butchers who know what they’re talking about. The Gloucester old spot sausages are a must try, really tasty. I’ve seen they’re now stocking in Brocklebanks Dalton too, what a one stop shop! To Celebrate the “six nations tournament” we have the best sausage from each competing nation.The sausage is made to the highest quality from each country. Come in and sample your favourites. Gloucester Old Spot Pig from Chris Turner of Ulpha Valley. Free Range Pigs from John Hadwin of Woodland. Burns Night Special-traditional natural cased Haggis from Scotland. Irvings butchers will be barbequing outside the shop over the Dickensian weekend,serving their famous Gloucester old spot sausage buns. There will also be a “Swing Band” playing for your entertainment. Irvings Butchers are now taking orders for all your Festive Poultry!